Big woop CourVO!…uh, I think we knew that. No, I mean, really…even if you don’t want to be on camera…you should learn to work with images, take videos, edit montages, graphics, and even think about posting your demos with a video cover (talk to Peter O’Connell…he’s tops on this!). Just look at the crazy, wildly ubiquitous, more-than-a-trend, hands-down incredible and continuing success of YouTube. ‘Second-ranked search service in the world next to Google (which owns YouTube, BTW). See VO Pro Bill DeWees’ 100th instructional YouTube video. He gets it! Me? I’ve been in video since the late 70’s, and I’m so jaded to the advantages of being on cam, that I’ve taken it for granted. No more. Recently, I’ve discovered and subscribed to a video email service, and I plan to start using it as a marketing tool, for follow-up, and everyday contact. Yeah, maybe a funny name, but this is an innovative, agile, and hard-working company that keeps adding value to my investment. 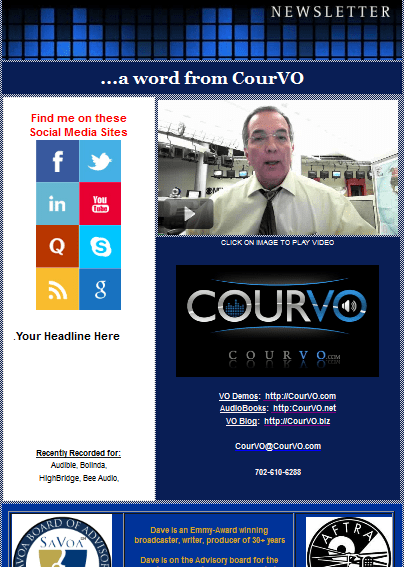 I can choose from scores of pre-designed templates to insert my video into — making it basically a video newsletter –complete with logo, contact information, links, and more. You can set up distribution lists and even “drip” your messages out on a schedule and get metrics back. It’s very much a CRM tool. Create embeddable forms and for your website or blog…I could go on…there are a lot of features. Record your videos separately (it imports all the popular formats), or record your video from within the program itself, insert in a template, and send in seconds. They give you a free trial period of two weeks, I think…and have reasonable rates. The folks at BombBomb are very customer-service oriented, helpful, responsive, and willing to listen to your ideas to make their product better. On sign-up, they’ll even custom-make you a couple of templates for starters. If you decide to contact ’em…tell ’em you saw it here, and we’re both better off!